In 2002, Michelle Kaufmann had a problem. More precisely, she had a headache. It turned out that the house she was renting had a toxic mold problem that was causing her migraines. As she shopped for a new home, Kaufmann came to realize that in order to get the kind of house she hoped to live in - environmentally sustainable, energy efficient, and built with nontoxic materials - she would have to design and build it herself. An architect who had worked with Frank Gehry, Kaufmann was used to questioning traditional approaches. She brought an innovative perspective to her personal housing challenge and took inspiration from sources as diverse as Modernist developer Joseph Eichler's midcentury homes, Italian courtyard villas, California ranch homes, and even rustic barns. The home she ultimately built, called "Glidehouse," incorporates elements of all of these and embodies the concept of clean design. Glidehouse feels bigger than its 1,500 square feet, thanks to an open plan and strategic use of space. 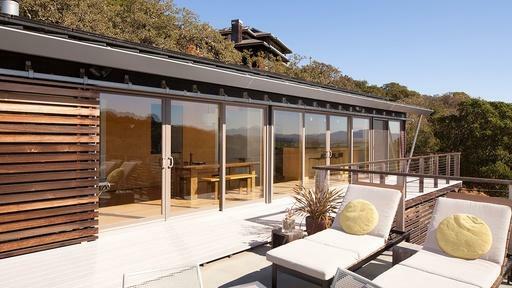 It includes sustainably harvested wood; solar panels that generate all of the electricity the house uses; recyclable COR-TEN® steel exterior cladding; and a system of sliding wood screens that shade the living spaces while allowing natural light to enter. Glidehouse requires no artificial air conditioning; Kaufmann studied how the California winds moved through her lot and carefully placed the home to maximize the way prevailing breezes flow across the property. The home's clerestory windows vent warmer air up and out, and the sliding panels regulate variations in warm and cool airflow. Glidehouse marries form and function so well that Kaufmann's friends started asking how they could get such a home for themselves. That led to her pursuit of modular, prefab construction, which avoids the waste of one-off, on-site construction and makes the home even greener. 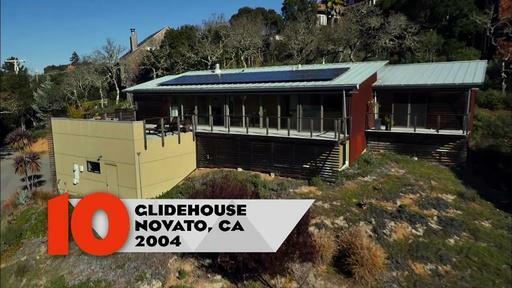 Glidehouse has been widely recognized for its green innovation. In 2006, the National Building Museum in Washington, DC held an exhibition that included a full-scale Glidehouse built on its grounds. Read a Sunset magazine article about Glidehouse. Explore a company making prefab, green homes modeled after Glidehouse designs and sustainability principles. Glidehouse employed a suite of environmental strategies in one affordable home.